Essential information for a successful visit on Montauk. Summer temperatures average in the upper 70s by day, going down to the high 60s to low 70s by night. Prevailing winds from the Southwest keep even the higher temperatures comfortable. Water temperatures average in the 70’s in summer. Spring arrives late due to the ocean’s moderating effect on temperature, which also causes fall to linger into November and winters to be generally mild. 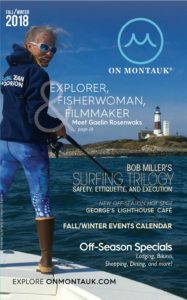 Montauk, much more casual and laid back than the Hamptons, does require shoes and shirts at most stores and restaurants, but very few require jackets and ties. Walking shoes and athletic clothes are a must. Nights can be chilly–pack a warm sweatshirt or sweater, even in the summer. Those Montauk breezes make you feel cool, but you still need a high SPF sunblock, even on a cloudy day. At the Montauk Library, also most hotels, motels, and many restaurants provide internet access. Montauk’s Roman Catholic Church, St. Therese of Lisieux, 631-668-2200 has Saturday night and Sunday morning masses. The Montauk Community Church (Protestant) holds Sunday morning services and hosts a summer bible school 631-668-2022 Call for times of services as they vary throughout the year. More churches and synagogues are found in the surrounding villages. Are located at Suffolk County National Bank and Chase Bank in the Village, and Suffolk County National Bank in the Harbor. More Machines are found at businesses in Montauk. Suffolk County Transit 631-852-5200 provides service year-round. The 10C bus travels a loop around Montauk, with a final stop at Newtown Lane in East Hampton. Bus stops in the Village at the Hampton Jitney stop on S. Euclid Street. Schedules available at the Chamber of Commerce office.